White flesh with great flavor. French aromatic. Smells as good as it tastes. Self-fruitful white freestone. Popular, large, yellow freestone. Early harvest fruit is firm-ripe and tangy, later harvest is sweet, with rich flavor: high-scoring in taste tests. Late July/early August in central California. Estimated chill requirement: 500 hours or less. Self-fruitful. Firm, yellow freestone with excellent quality. 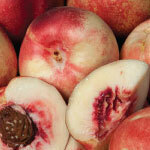 One of the highest scoring nectarines varieties in DWN fruit tastings. One of the very best! Ripens in mid-July in central California, between Independence and Fantasia. Susceptible to bacterial spot and tender to winter cold. Large showy blossoms. 650 hours. Self-fruitful. Taste test winner. Some consider it the best nectarine. Unique speckled skin is why it is called "Freckle Face." Self-fruitful yellow freestone, ripens in mid to late july. Long-time favorite in California and Western Oregon. Small to medium size white-fleshed freestone. Aromatic, juicy, sweet. Ripe in August. 400 hours. Self-fruitful. Bright red skin, firm yellow freestone. Rich flavor, tangy and sweet, one of the best. Consistently very high-scoring in taste tests. Winter & frost hardy, very reliable producer. Early July in central California. 700 hours. Self-fruitful. Very cold hardy, frost hardy, late bloom. Crops after sub-zero winters. Large, red-skinned yellow freestone, rich tangy flavor - very high scoring in taste tests. Highly recommended. Mid-July in central California. 800 hours. Self-fruitful. A modern descendant of Le Grand, this freestone brings the richness of gem peaches in smooth-skin form to the midsummer. Red Diamond is a rare supermarket nectarine that is worthy of backyard culture. Completely red outside, deep orange within, purple at the pit, rich, sweet, acidulous, outstandingly juicy when allowed to ripen on the tree at home. Produced by Fred Anderson, who learned fruit breeding from Grant Merrill, who learned from Luther Burbank: "unimpeachable" ancestry. On Lovell. Big as an apple--our overachieving nectarine! Sweet, tangy, big and juicy. This is the nectarine that California commercial growers plant to produce more than one million boxes each year! You can buy these nectarines in the grocery, but once you taste them at their peak, you'll never buy store produce again. Pick in mid-August. Small donut shaped fruit, perfect size for carrying around or for kids lunches. Very sweet. Self-fruitful white freestone. Ripens in late June. Large, smooth-skinned freestone nectarine. Vivid red with golden flesh. Sweet and distinctive. Comes free of the pit intact. Long storage life. Does not lose it’s flavor when canned or frozen. Self-fertile. Very large white fruit with great flavor. So juicy it explodes in your mouth! Harvest in june in Central Cal. Self-fruitful.